Jason Segel used to have nightmares just like Charlie, and just like Charlie, he’s learned that the things we’re most afraid of are the things that can make us strong . . . if we’re brave enough to face them. Jason likes acting, writing, making music, and hanging out with his friends. Sometimes he writes movies. Sometimes he writes songs for movies. Sometimes he stars in those movies and sings those songs. You might know him from The Muppets and Despicable Me. Your parents might know him from other stuff. Nightmares! The Lost Lullaby is his third novel. Look for the first two books in the Nightmares! series: Nightmares! and Nightmares! The Sleepwalker Tonic, available from Delacorte Press. Kirsten Miller grew up in a small town just like Cypress Creek, minus the purple mansion. She lives and writes in New York City. Kirsten is the author of the acclaimed Kiki Strike books, the New York Times bestseller The Eternal Ones, and How to Lead a Life of Crime. Nightmares! 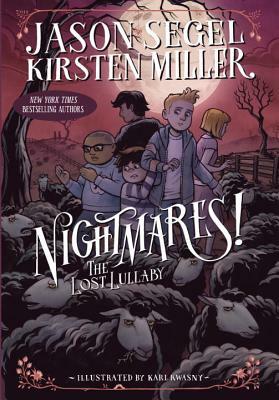 The Lost Lullaby is the third novel Kirsten has written with Jason Segel. You can visit her at kirstenmillerbooks.com or follow @bankstirregular on Twitter.